As health and wellness at home and the workplace gain further attention, more people are standing up, and embracing the natural movement our bodies require. 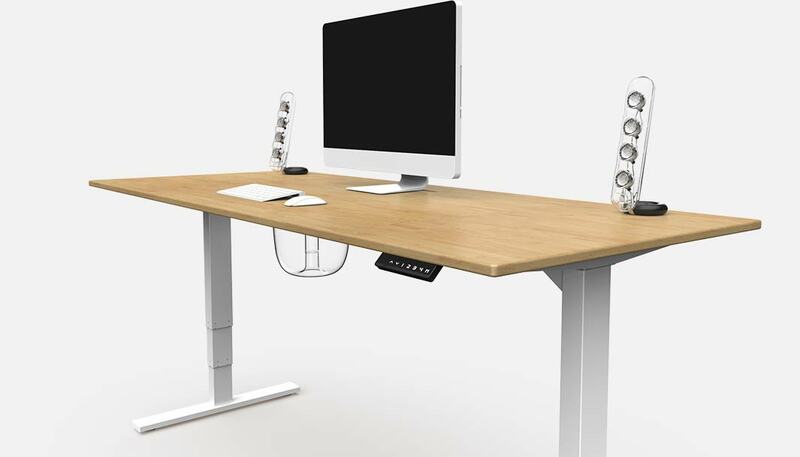 Learn more about how power adjustable standing desks can drive your sales growth. Our products were engineered from the ground up to provide extreme value specifically for channel delivery. Engineers were tasked with cutting out plastic laminate, and other lower quality materials while maintaining a winning price point. 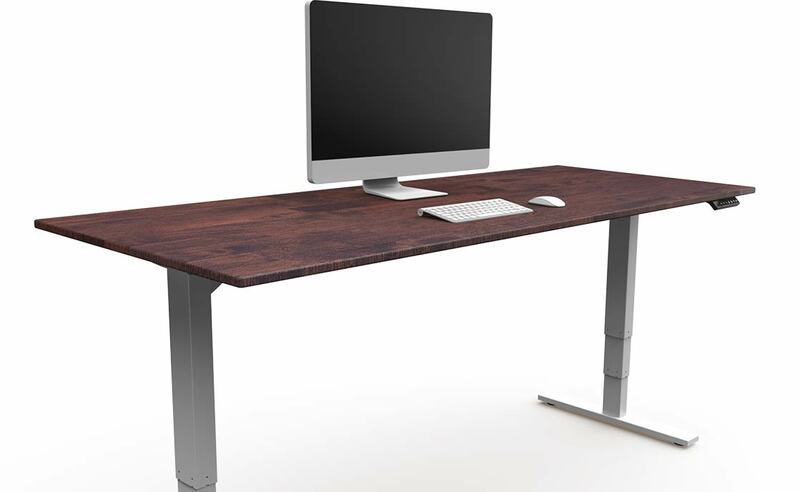 You’ll find professional-grade workstations crafted using sustainable materials like 100% recycled wood, rubberwood, and bamboo. 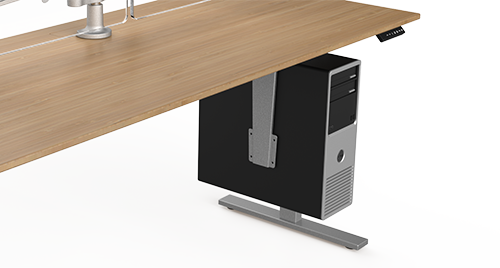 All power-standing desks move up and down, but our products also adjust laterally to accommodate a wide range of desktop sizes for future investment protection and redeployability. 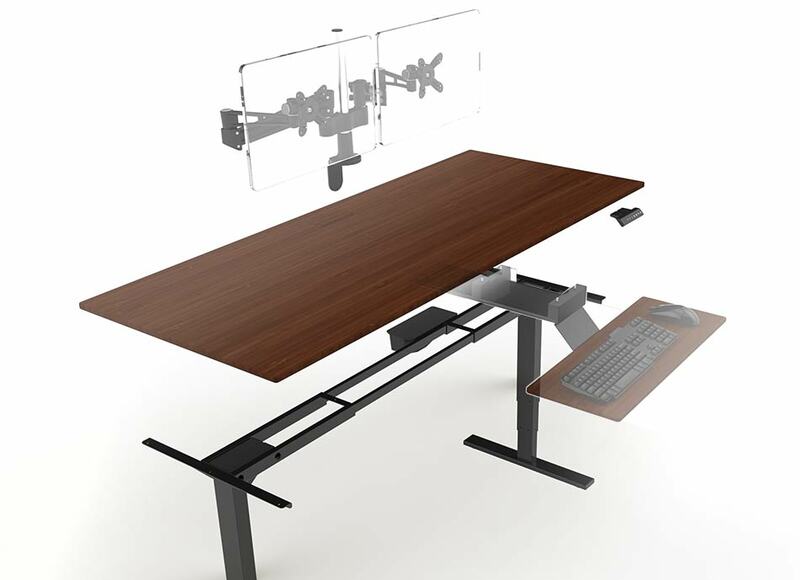 Simply expand the frame and interchange a 48”, 60”, 72”, or 90” desktop surface. Heavy gauge steel wall tubing means the frame can handle the weight even at its maximum extension. Sometimes what you put in is just as important as what you leave out. Plastic laminate is typical on low cost furniture. But your customers spend massive time at their desk and they want more. The desktop is the most visible part of the desk. Take a close look at the products we deliver and you’ll find no plastic laminate. You’ll find no plastic edge banding that can loosen and peel over time. You’ll find no uncomfortable sharp edges. The products we deliver are made with real material of your choice: recycled wood composite, Rubberwood or Bamboo. 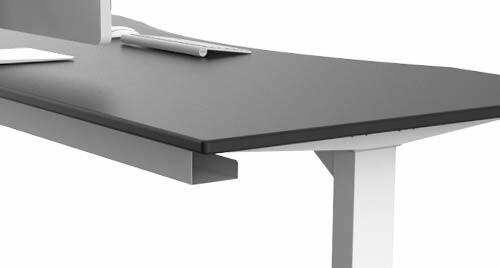 Each desktop is machined to give it a smooth contoured edge. Your customers can rest their forearms and wrists comfortably during long hours of work or play. Over 600,000 different design combinations! 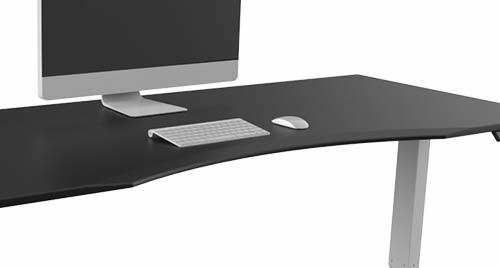 Our diverse selection of desktop surfaces help your client create a one of a kind standing desk that seamlessly integrates into any home or office environment. It’s the perfect fusion of visual design, functional engineering and craftsmanship. Add one or all options to customize your power desks and workstations. The choice is yours. The most popular option is the Ergo keyboard platform. 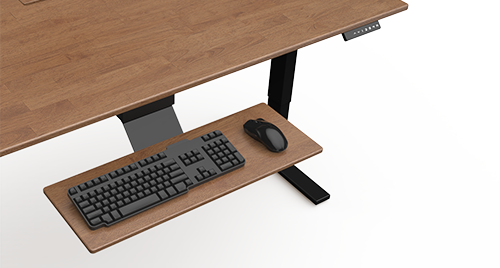 Customized to match each desk perfectly, the Ergo platform is designed for the perfect human body position during standing and sitting. We cut out toxic chemicals like urea formaldehyde, solvents, and lead based paints as well as volatile organic compounds or VOCs. All desktops are finished in the United States without the use of toxic chemicals. 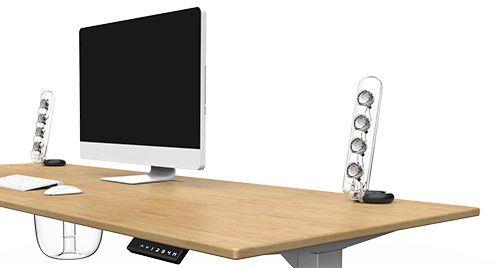 All natural Rubberwood and Bamboo desktops feature a solid sustainable desktop that’s finished with a 100% solid, ultraviolet light cured finish. 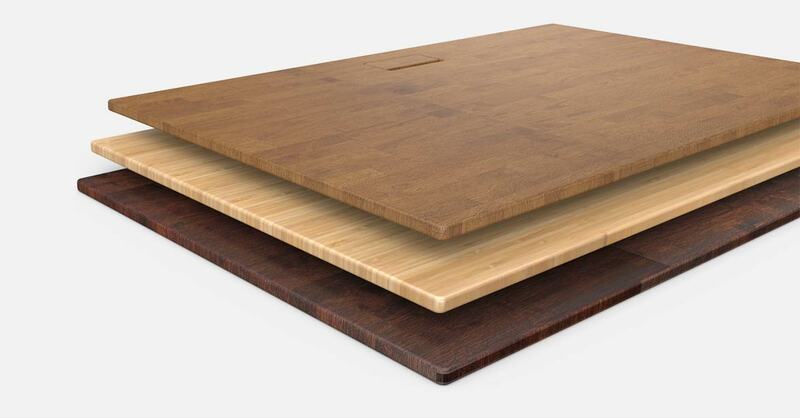 The 100% solid, ultraviolet cured finish creates a smudge-resistant coating that brings out the natural beauty of the bamboo and rubberwood.The powder-coated desktops are fully encapsulated in a coating that’s four times more abrasion resistant than plastic laminate. The most popular customer standing desk accessory, the programmable controller allows the user to store up to four height positions, adjusting to the ideal position with the single push of a button. Sitting or standing, the ergonomic keyboard platform is designed to conform to the proper ergonomic positioning for your wrists and forearms. Harman Kardon satellite speakers and subwoofer deliver world-class sounds with a major wow factor. Mounted seamlessly underneath the desktop. Designed to improve comfort through proper ergonomics, customers who choose to defer the keyboard platform prefer our ergonomic edge desktop. 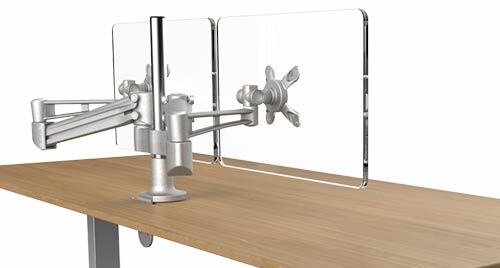 Reduce eye strain and save desktop space with the adjustable ergonomic monitor arms, available in single or duo configurations. 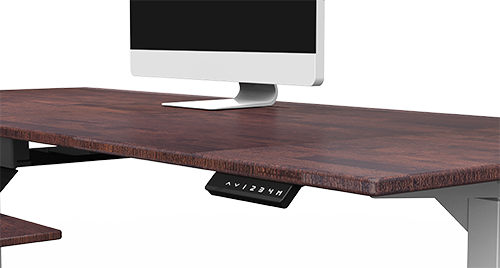 Easily tuck away and conceal all your desktop wiring and remove unsightly dangling wires from behind your desk with the cable management system. 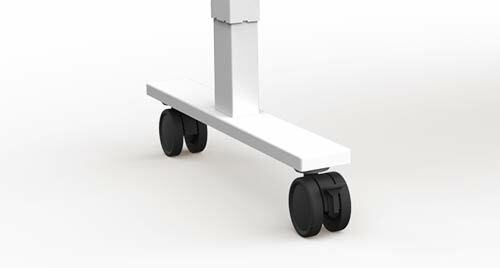 Oversized 3" wheels are crafted for smooth, even rolling on any surface type. Swivel easily and dependably lock in place when you are ready to park. Protect your CPU and keep your PC tower close. Whether sitting or standing, the CPU is always in reach, rising and descending with your every move.